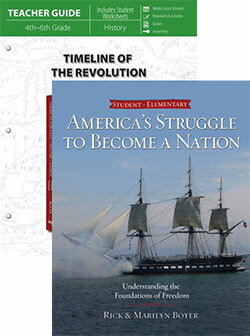 This American history course for upper elementary is written by Rick and Marilyn Boyer, the authors of Timeline of the Revolution. 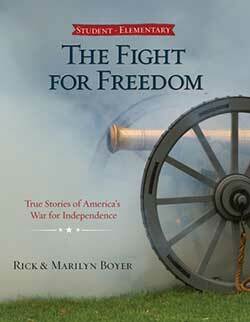 Learn true stories of America’s War for Independence—From non-revisionist sources. Read about the providential acts of God that made it possible to oppose the most powerful military on earth. Be introduced to the leaders, the causes, and the challenges of the Revolutionary War. Discover life-changing character lessons from the experiences of real American heroes and villains. The Teacher’s Guide, Biographies of the Revolution, is formatted for easy use. The Student Text, The Fight for Freedom, is illustrated with pictures of famous people and scenes. This course is part of the Master Books 4th Grade Curriculum Set. 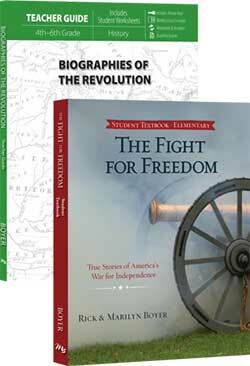 The Biographies of the Revolution Teacher Guide is easy to use with The Fight for Freedom. Student worksheets that are perforated for easy removal. Adjust the suggested flexible schedule to fit your needs. After reading the assignment text, your student will complete the corresponding activities in the Teacher Guide. 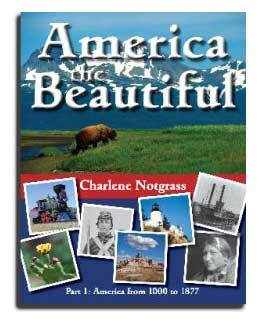 See sample at the publisher’s website. 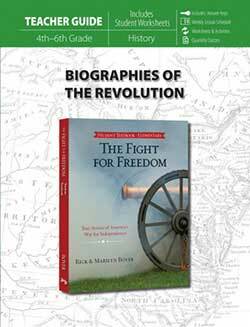 Learn about the leaders, the causes, and the challenges of the Revolutionary War. Meet over 25 heroes of the War for Independence. Study the character traits of the heroes from callouts with comments—Little boxes with interesting facts. Read about the providential acts of God that made it possible for colonial America to fight and win a war against Great Britain—the mightiest military power on earth at the time. Get the truth from non-revisionist sources.